Threadville Pennsylvania is a street of craft shops the feature everything from Quilting to Yarn Crafts. Willow Vanderling owns In Stitches, the embroidery shop. Today is a special day at In Stitches as Darlene Coddlefield will be presented with her new top of the line sewing machine. She has won a national competition sponsored by The Chandler Company. The company representative has arrived to award the prize and she is driving Willow crazy with her demands. Poor Darlene never gets to do more with her new machine but test it out for a few minutes. She is found dead under her sewing table that looks to have collapsed from the weight of the extremely heavy machine. It soon becomes apparent that this way no accident and the suspects are many including Darlene’s fire chief husband, “Plug” . Willow and her best friend Haylee even become volunteer firefighters to see if they can uncover the true culprit. Hopefully they can do it without getting burned. I was excited for another trip to Threadville. It is a place I would love to live. The characters are so well defined, they are already a group of literary friends. The high-jinks of “The Three Weird Mothers”, Opal, Naomi and Edna actually has me “in stitches”. I was laughing so hard I was crying. As a formerly addicted crafter who had been knitting, quilting and sewing since I was 8 years old until my accident in 2001, I can identify with each and every shop owner in Threadville and this story has given me a new respect for my sewing machine. My father was also the fire chief of our small town so the firefighters in this story made me smile even the cantankerous one. With the drought this year we can all understand the fire outbreaks and the sirens at all hours usually at night. Filled with all the elements a perfect cozy and a perfect escape! I loved the first book in this series and this one is even better. Kudos to the author! Do we really have to wait until June for the next installment? Be sure to check out Janet’s webpage here. Love Threaded for Trouble! Threadville and the characters. Plug the fire chief and, Darlene and Willow are fun group. What a terrific read. I started with Book one in Janet’s series, and I was hooked from the start. Wonderful characters, intricate plots, the dialogue is fun and breezy. I think this will be a terrifically sucessful series. Ive read the first book ( Dire Thread ).. in Janets series, and absolutely loved it! 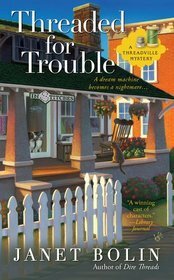 I cant wait to read “Threaded for Trouble”! Thanks so much for the review!